The Galloping Goose (actually the plural should be 'Geese'), or Motors as they were officially called by the railroad, were for sure among the most original railroad vehicles ever built. They largely contributed to the fame of the Rio Grande Southern and were its most prominent symbol from the thirties until its closure in 1951. These engines, built during the thirties, resulted from the absolute necessity for the Rio Grande Southern, then on the verge of bankruptcy, to cut its operating costs. They were meant to replace conventional steam trains becoming too expensive to operate, and were a kind of hybrid between a car or a bus riding on railroad tracks and a truck. 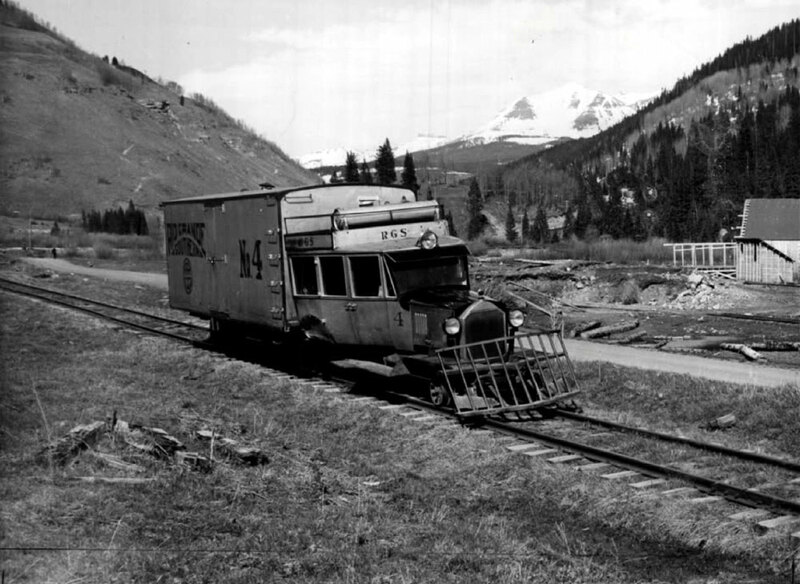 They constituted single-car mixed trains, cheap to operate and able to carry a small amount of freight, mail and express, and the few remaining passengers travelling between Durango and Ridgway. 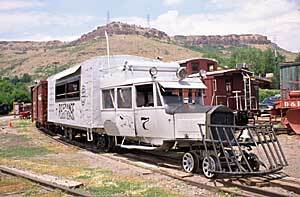 The Galloping Geese were built by the Rio Grande Southern shops in Ridgway, with very little means and a lot of ingenuity, from whatever material was available, spare car parts and other used parts. There are several hypothesis regarding the origin of the weird unofficial nickname (Galloping Goose) of the Motors. One of them claims that the name came from the waddling of the Geese on the uneven Rio Grande Southern track, another attributed the nickname to the goose-like honk of the horn of the Motors, very different from the usual whistle of steam engines. All the Geese have survived until now, except one (of which a replica has been built). Among the survivors, all but one are operational and are used occasionally on the loop track of the Colorado Railroad Museum, on the Cumbres & Toltec or on the Durango & Silverton. Goose #1 replica at the Ridgway Railroad Museum at the northern terminal of the Rio Grande Southern line in Ridgway. Actually two different Motors of the Rio Grande Southern bore the number 1. The first Motor #1, built in 1913, was an inspection speeder derived from a Model T Ford and may be considered as the ancestor of the Geese. Second Goose #1 was built in 1931 following an idea of the Rio Grande Southern superintendent and its chief mechanic officer in Ridgway. It may be be considered as the first true Goose and the prototype of the whole serie. She was based on a Buick Master Six sedan, converted to rail operation and fitted with an open platform on the rear to carry mail (hence the U.S. Mail lettering on the side doors) and express. She was equiped with a front truck and a single rear powered axle. She is the smallest and the lightest of the Geese built by the Rio Grande Southern. The design of the Motor was an immediate succes and Goose #1 soon replaced the passenger steam train between Dolores and Durango. She was scrapped in 1933. 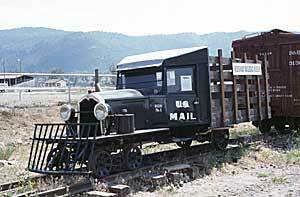 A replica was built in 2000 and is today displayed at the Ridgway Railroad Museum in Ridgway. The replica is built from the same type of car as the original #1 and is operational. Goose #2 at the Colorado Railroad Museum in Golden. Built in 1931, she is still operational. The success of Goose #1 and the cuts in operating expenses it allowed soon prompted the Rio Grande Southern to considered building more Geese based on the same principle. Goose #2 was born in 1931. She is based on the same type of Buick sedan as #1, but runs on two trucks (the rear one is powered) and is twice as heavy as #1. She has space for four passengers and her freight compartment is completely enclosed and bigger than #1's. Goose #2 livery was originally of the same black as the Buick sedan she was derived from. All the Geese were repainted silver in 1935 and had kept this colour since then. Another view of Goose #2 from the rear, beside Work Goose #6 at the Colorado Railroad Museum. In 1939, Goose #2 is rebuilt with a 1926 Pierce-Arrow car body and is equiped with a new and more powerful Buick engine. At that time, Goose #2 doesn't see much use anymore because newer Geese have been put into service, so #2 is most of the time on stand-by duty. Today, #2 is preserved at the Colorado Railroad Museum and is operational. Goose #3 was also built in 1931, following #1 and 2. She is 50% heavier than #2 and is longer too. She is the first Goose running on three trucks (the middle one being powered) and to be articulated. She is mostly made of 1926 Pierce-Arrow parts for the body of the passenger section and for the engine. Goose #5 in front of the freight house at the Dolores depot. She is presented in its tourist version of the fifties. She has a capacity of ten passengers and is rated 39hp. 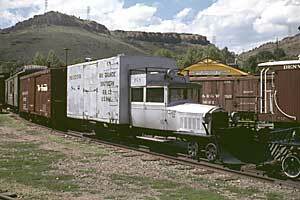 The rear freight and mail section is almost the size of a boxcar and is supported by two trucks. Geese #4, 5 and 7 will be built following the same principle (Pierce-Arrow parts and an articulated frame on three trucks). 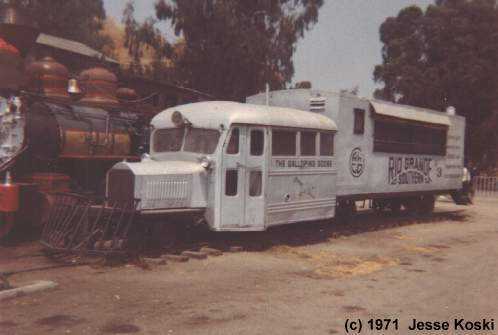 At the Rio Grande Southern closure, Goose #3 was sold to an amusement park in California (Knotts Berry Farm), where she runs occasionally (picture on rgs.railfan.net). Rear view of Goose #5. Note the stove smokestack, the salvaged door on the rear and the side windows added to the freight compartment. 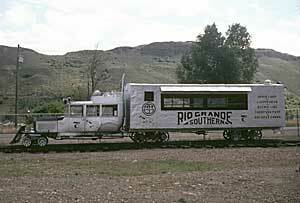 Number 3 was so successful that the Rio Grande Southern started to build another Goose (#4) the following year (1932). She is almost the same as Goose #3 (Pierce-Arrow parts and an articulated frame on three trucks). She is the only non operational Goose among those who survived today. She is displayed in the city of Telluride, the terminal of a Rio Grand Southern branch (picture on blogs.denverpost.com/library/2012/06/13/galloping-geese-rio-grande-southern-railroad/1749/). Front of Goose #5 with her pilot plow. She was refurbished in 1946 with a Wayne Bus Co. body. 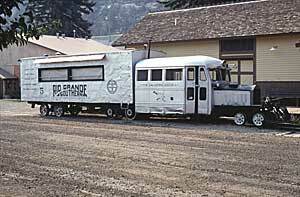 Still following the design of Geese #3 and 4, the Rio Grande Southern shops built Goose #5 in 1933. She was still based on Pierce-Arrow body and engine. Once #5 was put into service, the railroad could discontinue the last steam-powered passenger trains, so Geese #3, 4 and 5 were in charge of all the passenger service. They also carried mail and express. In 1946, Geese #3, 4 and 5 received new Wayne Bus Co. bodies. 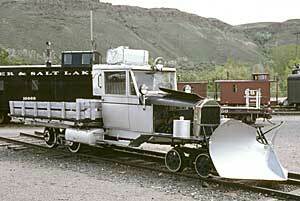 Soon after, they exchanged their Pierce-Arrow engines for WWII surplus GMC engines. In 1950, the already financially troubled Rio Grande Southern lost its mail contract with the U.S. Mail (the mail was then carried by trucks). The volume of express to transport was also dwindling. The rear compartment of Geese #3, 4 and 5, used for freight and mail, was then converted to a passenger area by cutting side windows and adding bus seats. The Geese were converted to excursion service. At that time only were they officially named Galloping Goose by the Rio Grande Southern (the name has been used unofficially for a long time already). Their livery was modified with the mention of the tourist landmarks of the line, and a goose drawing was also painted on their flanks. After the closure of the railroad in 1952, Goose #5 was bought by the city of Dolores to be displayed with the preserved Rio Grande Southern depot of Dolores. 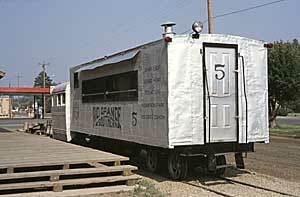 Number 5 was completely rebuilt in 1998 by the Galloping Goose Historical Society in Dolores and is now operational again. She runs regularly on the Cumbres & Toltec and the Durango & Silverton. Work Goose #6 at the Colorado Railroad Museum. Built in 1934, she was used as work train. Goose #7 at the Colorado Railroad Museum, she still has her original Pierce-Arrow body. Goose #7, the last built by the Rio Grande Southern in 1936, is very similar to Geese #3, 4 and 5. Like them, she is articulated, runs on three trucks and is made of a 1926 Pierce-Arrow body for her passenger compartment. But as opposed to the other articulated Geese, she is equiped with a Ford V8 engine. Another difference with the other Geese (except the short lived #1) is that Goose #7 has kept her original Pierce-Arrow body until now. Side view of Goose #7 in her tourist version of the fifties. She is articulated and runs on 3 trucks. As Geese #3, 4 and 5, #7 has been converted to tourist operation by transforming her rear freight compartment into a passenger area. The four converted articulated Geese will be used for excursion trips and charter trains during 1950 and 1951 seasons, until the demise of the railroad. Goose #7 with Work Goose #6 were used to scrap the Rio Grande Southern line after the closure of the railroad. 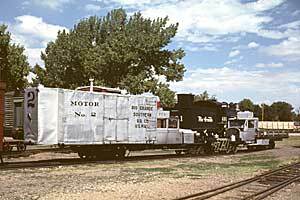 Now she is preserved at the Colorado Railroad Museum. 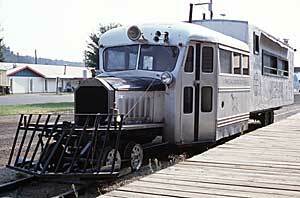 She is operational and occasionally runs on the loop track of the museum. The information gathered on this page comes from the different websites mentioned and a series of articles in the Narrow Gauge and Short Line Gazette, 'A Gaggle of Geese' by Mallory Hope Ferrell.